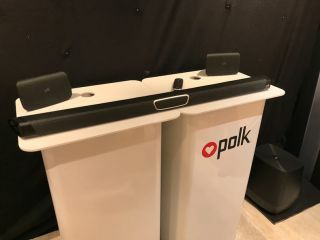 Polk launches Magnifi Max soundbar and Signature range of loudspeakers | What Hi-Fi? Polk has a new soundbar. Called the Magnifi Max, it features universal compatibility and Polk Voice Adjust technology, which should help you pick out dialogue over the explosions on whatever you're watching. It also features Polk's SDA surround technology, which recreates the effect of surround sound from a single soundbar. Dolby Digital and DTS decoding should enhance the audio. It has two tweeters and five full-range drivers, and works alongside a powerful 20cm wireless sub. You can stream to it via Bluetooth and using the Google Home platform. Connections-wise, there are three HDMI-ins and one HDMI-out, as well as optical and aux inputs. It also has special modes for genres and moods: Movie, Music, Sport and Night. The Polk Magnifi Max goes on sale in August, priced £500 with the wireless subwoofer. The Magnifi Max SR variant costs £650 and adds a pair of wireless surround speakers into the equation. Polk has also announced its new Signature Series, a premium range of hi-fi speakers made with acoustically inert enclosures and Polk's patented Power Port technology, a cone at the mouth of the port that promotes smooth airflow, eliminating distortion. So what's in the range? There are three floorstanders, the S60 are £900 a pair, the S55 £700 a pair and the S50 £500 a pair. The bookshelf units are the S20 (£300 a pair), S15 (£250 a pair) and the S10 (£200 a pair). The S30 (£250) and S35 (£300) centre speakers complete the line-up.